I suggest replacing old high voltage (greater than 400 volts?) electrolytic capacitors. However - I have formed some definite opinions about the characteristics of long unused (no voltage applied) electrolytic capacitors in this 1401, and likely other industrial electrolytic capacitors of the 1960s and 1970s. 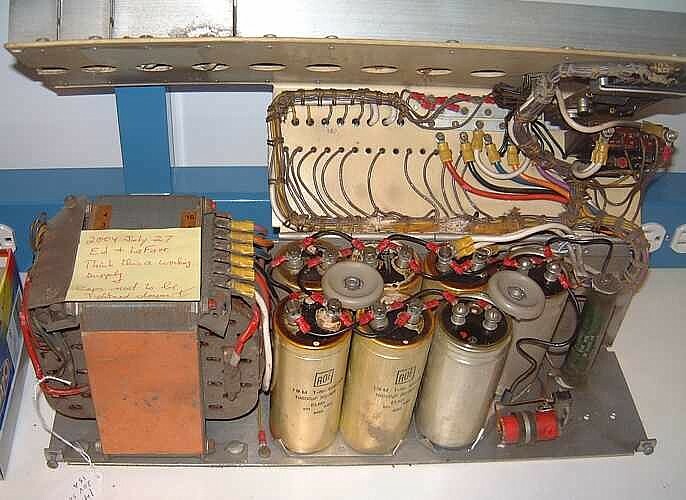 The 1401 system had not been powered up for at least 20 years, and we worried about the electrolytic capacitors. Of over 100 capacitors tested, none failed nominal testing. "Higher voltage" electrolytic capacitors (say over 70 volts) take a lot more "reforming" than "low voltage" electrolytics. Ron Williams made a nice 30 volt unit with a low wattage electric light as a current limiter, as per various Internet sites. Hmmmm - no picture? This was useful in testing/reforming the capacitors in the power supplies in the 1401 itself. See 1401 capacitors. It was difficult to distinguish the normal inrush current into a capacitor, from any reforming action that might be occurring. The current limiter lamp seemed to glow in about the same time pattern with both long unused and recently used capacitors. It seemed that these low voltage capacitors were relatively well formed. There were several capacitors that had oozed in service, and the results were now hardened - presumably by evaporation. These units tested as working, and are actually in service in the 1401 now. We tested each capacitor for at least rated capacitance at rated voltage by watching its discharge curve through a known resistance. We also tested each capacitor for internal leakage by charging the capacitor up to rated working voltage, letting it soak for maybe 30 seconds, then watching its discharge curve through the usual voltmeter 10 meg-ohm resistance. If it seemed to be less than 5% in about 60 seconds we figured it OK. There was a fuse blowing situation in a 026 key punch donated by someone in Morgan Hill. We found an electrolytic capacitor, reformed it, and the fuse blowing went away and we could get on with trying to make the rest of the 026 work. (Jan 22nd, 2005) That capacitor took about a minute to reform through a 4 watt 120 volt light bulb. Using the above variable voltage system we tested/reformed a number of low voltage (below 30 volt working) and higher voltage (up to 170 volt working in a 729 tape drive) capacitors. The 60 volt capacitors seemed to take about 2 times the normal inrush current to begin normal function, and the 170 volt capacitor seemed to take 15 or 20 times the normal inrush current to reach normal working voltage. Capacity and leakage of all tested capacitors seemed reasonable. Grant Saviers later got us a capacitor tester that also tested ESR, (Effective Series Resistance). See Wednesday September 7th report on main page. We have not used this since the capacitors seem to be working well, and run at about ambient temperature (they do not get noticeably warm from their ESR, so we assume their ESR values are well with in requirements. a) normal inrush coulombs vs excess coulombs that may be reforming the capacitors, in the various capacitance and voltage ratings. b) ESR of the capacitors. and provide more interesting details. > the long-term performance of the parts. The above is identical with my "impression". capacitor than its actual capacitance value. no longer "smooths" those pulses. too high. This is what the "Capacitor Wizard"
Robert mentioned that it would be nice to find diagnostic tests/information predictive of early end-of-life of electrolytic capacitors. where someone blew-it on the magic elixir electrolyte. The Sencor tester I brought in does not test ESR. a full frequency response being ideal. FWIW, we completely ignored ESR in our measurements. / time versus useful information didn't seem worth it. in full-wave linear power supplies. > How are you and the 1401 project doing ? > I believe you are the specialist on reforming capacitors. > been out of action for at least 20 years. Do you have any restoration tales? > It's capacitors might need reforming. > and hopefully you can shine some light on them. > Q1: what is exactly the issue with these old unused capacitors ? until some controlled current in applied for a while. This application of controlled current can be called "reforming"
I have no idea what the manufacturing process is currently. > Q2: what happens when reforming ? increasing its ability to withstand voltage across the layer. > Q3: what are the consequences if I don't reform them first ? you might not notice much difference. incandescent  lamp in series with the power cord. for much longer times with the higher voltage capacitors. > Q4: was reforming really needed with the 1401 electrolytic capacitors ? There are folk lore stories of exploding capacitors. the resulting internal and external damage. unused in a garage for many years. We turned it on. Checking about we found an open fuse, replaced it. Turned on the 026 - nothing - and the new fuse was open. Bother - some darned short !! Then we spotted a 300 volt electrolytic capacitor in there. Hmmmm - could that be it?? then slowly turned dull red, then on light. with the "reforming" apparent at each step. > Thanks for time and reply ! have a capacity range of from +10% to +90% rated. very little DC heating effect which might get exciting. resistance increased with stress time. under rated load for say 10 minutes in still air. of any of the capacitors in any of the power supplies. Added comment about electrolytics rated at and used above 350 volts? I had heard via the Internet that lots of radio restorers recommended replacing electrolytics and not bothering to try to salvage them. Since I was dealing with large, high quality, much lower voltage electrolytics, I could not comment. I recently purchased an old Pilot tube audio amplifier with a pair of 6L6's with 550 volts on their plates. So I decided to try reforming the electrolytics. The test set up included series light bulbs rated at 110 volts various wattages. I pulled all the tubes except the new Russian 5Y3 rectifier tube (the old one had an open filament). At about 1/3 filament voltage, the 5Y3 was conducting enough to begin charging the capacitors which went slowly to 220 volts. Strange snapping noises came from the chassis, I couldn't figure where - or by what mechanism the snaps would be propagated to the air. As I swapped series light bulbs and played series parallel games, I brought the voltage on the filament of the 5Y3 up to 300 volts. The snapping / sparking noises increased in volume/ intensity. The series light would flash briefly at each snap. At 400 volts on the 5Y3 I concluded that these capacitors were "interesting" - as in "living in interesting times". I decided to continue raising the input voltage to rated but that the electrolytics is this amplifier probably should be changed - but continued increasing the voltage. It was late and I was tired, so I chose b) above. Across the line, unfused, no series limiting resistance. Indeed, that last step was easy, lets let it soak at that voltage for a while. I turned to other things. About 10 minutes later, the lights in the room blinked, there was a loud hum from the transformer. As I jerked the line cord out of the socket I noticed the 5Y3 had a violet glow. Enough excitement - I suggest replacing old high voltage electrolytic capacitors. Don't even bother - I don't know what happened - but once was sufficient. Computer History Museum's PDP-1 in 2003-2004. He says that their solution (involving "software to control an HP E3631A power supply") was "very over-engineered". provide margin for shelf life. recommendations for reforming their capacitors. layer is degraded and voltage is applied without current-limiting. the handbook may be useful in determining or evaluating requirements." experience with reforming very old capacitors. based on the applied voltage, though not up to original factory spec. initial factory forming, provides some margin for further shelf life. data on how much shelf life they can have without needing reformation. > I would guess ripple current. those. Lambda used them extensively in their linear PSUs. Reforming is standard practice with industrial motor drives. current limiting DC (1000V) power supply.